Making charms with Podgeables is super easy and a little addicting! 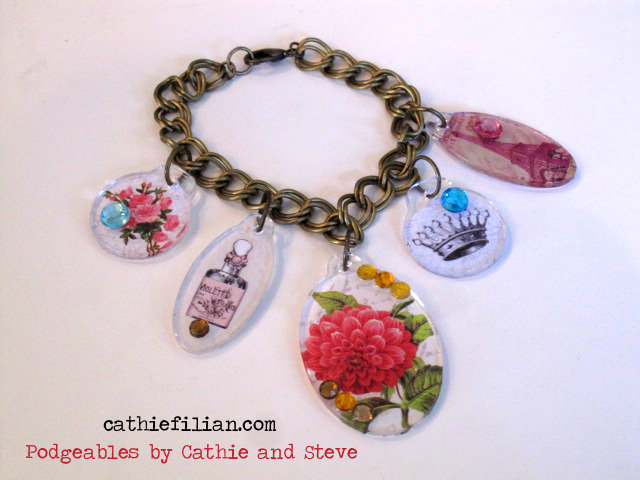 For these charms we used the small Mod Podge Podgeable shapes available at all Michaels Stores or online at Create For Less. The papers are from our Mod Podge paper collection. The featured images are from the Travel, Romance and Classic paper packs. 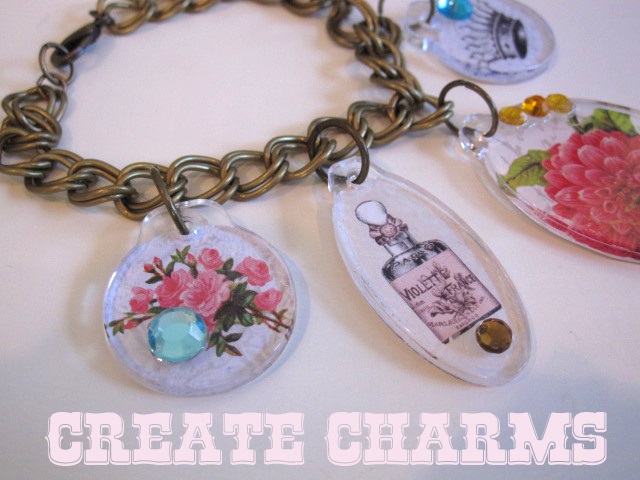 To make the charms you will need to cut the papers to fit the acrylic shape. You can use our tracing templates or just trace around the shape. Next you will apply a coat of Mod Podge gloss to the top of the paper (image side) and press the paper to the underside of the Podgeable shape. Press with your fingers to remove any air bubbles. Allow to dry for 15 min. Top coat the back of the paper with 2 layers of Mod Podge. Using gem glue, glue gems to the top of the acrylic Podgeable shape. Attach jumprings through the holes and attach to a chain bracelet. Pop back every Monday for more Mod Podge tips, tricks and project ideas! Love This! I still have the Dresser with the poster saved on my television from Creative Juice one of these days! You and Steve make creating so fun! I can't wait to try out the podgeables!!! Can't wait to try this project! I want to try it with fabric instead of paper. Do you think it'll work?